SUMLOCK model 912/S British Sterling currency (£sd) "Comptometer". This is a full-keyboard direct action keyboard calculator of the "comptometer" type for Sterling currency calculations. 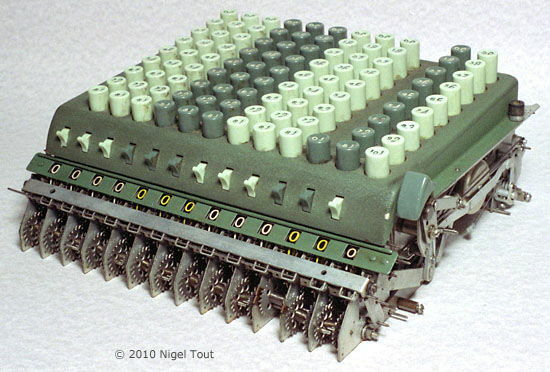 It is a model 912/S where the 9 denotes the full keyboard (keys up to 9), the 12 denotes the 12 columns of keys, and the S denotes a Sterling currency version. The machine illustrated has serial number 912/S/4AH/120.260. To enter 11 in this column the operator has to press in turn the (9) key and the (2) key. See the Old Sterling Currency section for more information on the pre-decimalisation money system used in Britain and the British Commonwealth. 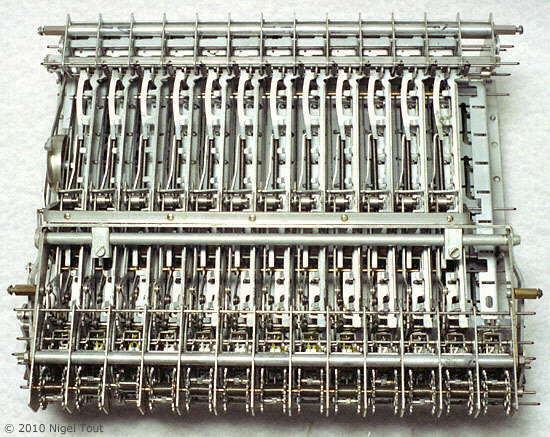 The Sterling currency keyboard (£sd), with the rightmost column limited to the keys 1 to 9, instead of the 1 to 11 in a fully keyed model. 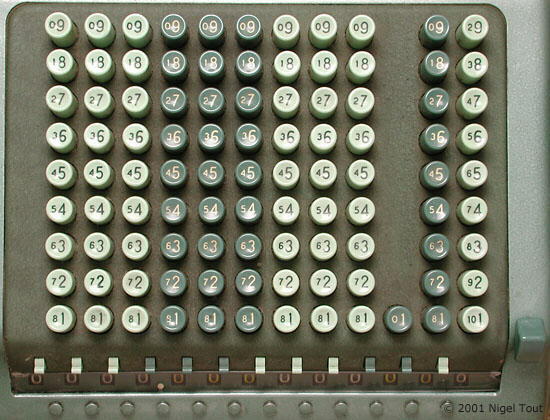 The small numbers, to the left on each key, are used for subtraction. Here the base has been removed. All of the mechanism is attached to the top plate with the keys. The mechanism from below. Each column has an identical assembly of gears and levers. There is an operating manual for the Sumlock "Comptometer"-type machine in the Operating Manuals section of this site, with a summary on the Operating a Comptometer page.